Artist’s illustration of Orbital ATK’s Next Generation Launch (NGL) System on pad 39-B at NASA’s Kennedy Space Center. NGL vehicles will have the ability to operate from both east and west coast launch facilities. COLORADO SPRINGS, Colo. — Orbital ATK intends to parlay its extensive solid-fuel booster manufacturing capabilities into a new family of medium- and heavy-lift rockets to compete against United Launch Alliance, SpaceX and other companies for U.S. government and commercial customers. Unlike the situation with some of its competitors, however, Orbital said it must win a follow-on Air Force Launch Services Agreement (LSA) contract to be able to develop its Next Generation Launch System (NGL). A draft solicitation for LSA proposals was released last month. On its own dime, Virginia-based Orbital expanded the scope of the work to make sure that the propulsion systems being developed under its Air Force contract would have a family of launch vehicles they could go into, Mike Laidley, vice president of Orbital's space launch programs, said in an interview here this week during the 33rd National Space Symposium. Orbital ATK has finished manufacturing the first development rocket motor case for its new family of intermediate-and large-class rockets, known as the Next Generation Launch System. With a final LSA solicitation expected this summer, "it's time for us to move forward and start working on the full launch system and announce our intent," Laidley told Space.com. For now, Orbital isn't planning to certify its rockets for human spaceflight, but it could do so in the future, Laidley said. "It's not fully redundant, but certain key elements of it are," he said. The company is not planning to recover or reuse any of its rockets' components. Instead, Orbital will keep costs low by integrating common elements, such as avionics, flight computers and materials for composite structures, across its products, Laidley said. Orbital manufactures ballistic missiles for the military, the Pegasus and Antares launchers, booster rockets for NASA's Space Launch System (SLS) and other systems. "We count on being able to fly a breadth of products over a broad diversity of flight environments to actually reduce our cost on a per-launch basis," Laidley said. That strategy also means that NGL will need to fly just three to four times per year to make the new rocket financially viable for Orbital, added Mark Pieczynski, vice president for business development at Orbital. In addition to the military’s launch business, NGL will vie to fly NASA science missions and commercial satellites, he added. Two versions of the rocket are planned. The medium-lift variant will have a two-segment, solid-fuel first-stage motor and a single-segment, solid second. The heavy lifter will have a four-segment first stage and a single-segment second. Both versions can be outfitted with strap-on boosters for extra lift capacity, Orbital representatives said. The rocket would fly from both the Atlantic and Pacific coasts. 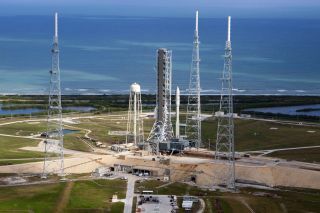 In Florida, NGL would launch from NASA's Kennedy Space Center Launch Complex 39B, sharing the pad with NASA's SLS. Orbital has not yet selected a site at Vandenberg Air Force Base in California for satellites needing rides into polar and high-inclination orbits.